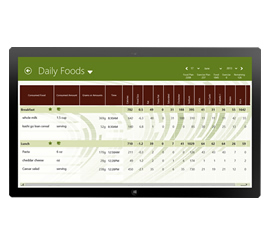 With MyNetDiary app built from the ground up for the Windows, planning and keeping track of your foods have never been easier - our high-quality over 968,000 foods database with search-as-you-type magic lets you enter foods in seconds. It's very natural on the Windows - tap a row in the foods table and simply start typing, MyNetDiary immediately shows foods found, tap the one you need, and then tap the amount - this is it. MyNetDiary Windows Store app synthesizes the best of online and mobile worlds into something amazing, simple and powerful, something you can touch, something changing people's lives. You can read a detailed list of features in the next section. Here we want to highlight just three things you can get only in MyNetDiary for Windows. Most natural and easy food diary in the world. You have to try it to believe how easy it is. It's the only app in the world that is so fast that it searches as you type. The best food database, with the best balance of quality and quantity. Works great online and offline, without internet connection. It syncs automatically with all of our mobile apps and the website. MyNetDiary provides rock-solid sync that just works. MyNetDiary for Windows is built from the ground up optimized for the new Windows design style, but it draws on years of experience in building and supporting our online service and our great mobile apps, on listening member requests, suggestions, and recommendations of healthcare professionals. We relentlessly improved, added (and removed!) features, in this quest for a perfect diet software, and used this great opportunity to build something truly awesome. Our users love MyNetDiary for Windows. Easy, detailed diet planning helping you estimate your calorie needs and set targets. If you would like more control over your diet, you can override calories with your doctor recommendations, and adjust macronutrient balance preferences. It's very helpful for low-carb and low-fat diets. Favorite foods - for quick selection, without any typing! Daily analysis - get helpful recommendations, what should you watch for, what you could improve. Food Score - a simple way to evaluate Nutrition Facts and make healthful food choices. Water tracking - simply tap each water glass. Daily Notes - keep track of your mood, thoughts, hunger, sleep. Vitamins & medications - make a quick text note, register your reactions. Tracking of all body measurements - waist, hips, thighs, and more. More tracking - blood pressure, hours of sleep, daily step count, etc. Full set of charts, including nutrient and measurement charts. Optional food time tracking - helps you accurately track smaller and more frequent meals. MyNetDiary supports English and metric units. MyNetDiary for Windows is not just a standalone app. It's a part of MyNetDiary - a modern, comprehensive online diet service, with great online food and exercise diary, Online Community, great library of health and diet articles, and great mobile apps for iPhone, Android, and BlackBerry. More great tools for diet and health management are coming soon to MyNetDiary! Your diary is safely stored on our servers, and could be also accessed online - for food entry, data backup, export to Excel, and community participation. 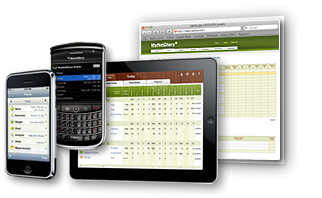 Get our iPhone, Android, or BlackBerry applications - to log your foods and exercise when on the go. Windows, iPhone, Android, BlackBerry and the web site are always in perfect sync. The Online Community is supported by a Registered Dietitian. Family and private groups are available through Community. You can enable Twitter integration, and choose tweeting of foods, exercise, or your diet progress. No more hiding! MyNetDiary for Windows is available on the Windows Store for $4.99. There is no better, easier, or more comprehensive way to lose weight and manage your diet than with MyNetDiary for Windows. Think of all diet books and diet pills you won't need. Think of expensive weight loss programs and procedures. Think of your health. MyNetDiary follows guidelines of the Academy of Nutrition and Dietetics and it works well. It's a bargain.